During this landscape photography exercise – I used a compact system camera, a Sony A7 Mark II – Full Frame with a Sony A FE24-240mm F3.5-6.3 OSS Lens. For these photographs I used the camera mounted on a tripod and also handheld when needed. I also used my Apple iPhone 8 Plus mobile phone for quick spontaneous photographs and gain GPS location readings. During this landscape photography exercise – I used a compact system camera, a Sony A7 Mark II – Full Frame with a Sony A FE24-240mm F3.5-6.3 OSS Lens. For all these photographs I used the camera mounted on a tripod. I also used my Apple iPhone 8 Plus mobile phone for quick spontaneous photographs and gain GPS location readings. Some of the photographs of the trains and carriages I felt would do better being developed as black and white images. It also gave me a chance to experiment and be more creative. Two of the photographs I left in colour and mainly because they looked better left as taken but also due to the fact they were both taken on my mobile phone and the quality wasn’t there to produce a fine black and white version. On our way back home from Warrnambool May this year, we stopped off at Tower Hill Wildlife Reserve, Illowa, Victoria – Australia. A beautiful view from the roadside helped us to appreciate the 4km wide crater lake. The wildlife reserve sits inside the extinct volcano formed some 30,000 years ago and is considered a haven for wildlife as the tiny crater-bound ecosystem provides a natural habitat for many animals. While the day was overcast, the weather was kind and I was able to take a small selection of landscape photographs. Sadly we could only stay for a short time, but it is a location we hope to return to sometime in the near future. NB: Below is one of the many emus which can be seen while walking and driving through the wildlife reserve. They are big and not too afraid of humans which can be a bit scary. This particular emu must have thought we had food for it, but that big beak and those giant claw-like feet sure made us realise that there birds need to be respected and we kept our distance! One grey cold autumn day in May this year, hubby and I travelled to Mount Macedon, Victoria – Australia for another photography adventure. This region is best known for its19th century gardens and associated collection of extravagant large homes. On this day, we just concentrated on the Gardens Of Tieve Tara – a truly beautiful and picturesque garden consisting of 7.5 acres of lush grounds, sweeping lawns, a whimsical playground, lakes, geese and fountains (Tieve Tara 2018). As a hobbyist photographer, these gardens during autumn provided me with an incredible variety of opportunities to capture the magic of autumn; there was so much beautiful vibrant colour and variations of textures to enjoy! We had a lovely time walking about and photographing these gardens, and will definitely be back in years to come to visit other wonderful gardens within the region of Mount Macedon. 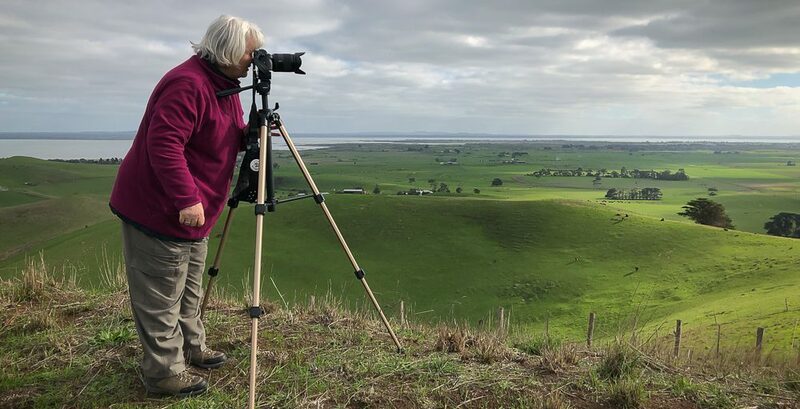 While at the 64th Convention & Interclub Photographic Exhibition in May 2018, hubby and I took some timeout to visit a scenic area of the Hopkins River, Warrnambool, Victoria (Australia). The Hopkins River estuary is approximately 9 kilometres long and culturally significant. It marks the tribal border of the Kirrae Whurrong, Gunditjmara and Tiap Whurrong peoples; once a place for gatherings and trade. Now provides a premier fishing experience for both local and visiting anglers. On this day during the late afternoon, the weather was beautiful and a lovely way for hubby and I to chill-out together. I was particularly happy to be able to photograph a pair of Australian Pelicans that were drifting happily alongside of the jetty. Hubby and I stopped at Red Rock (Alvie, Victoria – Australia) during one of our photography adventures last month. It wasn’t planned, but thankfully we did take the opportunity to divert from our journey to Warrnambool. May rains had worked its magic and turned this summer dry landscape into lush green rolling pastures. We experienced magnificent 360-degree views from atop of Red Rock which over looks Lake Corangamite and Lake Colac. Spectacular complex volcanic sites, formed by eruptions some 10’s of thousands of years ago with the last eruption 8000 years ago. These can be seen across the surrounding topography of volcanic plain and the 25,000-hectare Lake Corangamite. We spent some time here taking photographs and just enjoying the breathtaking views from every angle, on a glorious Autumn day. Last Saturday, at 3am in the morning, Hubby and I headed off to Milawa, Victoria – Australia to see the 6.45am King Valley Balloon Festival ‘Sunrise Balloon Mass Ascension’ at Brown Brothers Milawa airfield. The grey overcast morning didn’t stop the event taking place thankfully, and spectators were able to view for free this spectacular yearly event. We also had the chance to walk around and experience the ascension close-up which gave us an appreciation of just how big these balloons are once in flight. We enjoyed our time marvelling at these giants of the sky and this photography adventure certainly provided me with a challenge in trying to photograph them. A beautiful day at Woodlands Historic Park, Victoria – Australia which is located just a short distance from my home. Hubby and I with other members of the Craigieburn Camera Club engaged in a ‘free format photograph shot’ where we wandered around this nature preserve taking photographs that were of interest to the individual photographer. We experienced glimpses of landscapes and wildlife seen by European settlers in the 1840’s (Park Victoria 2018). A 150-year old homestead stands on the property; indigenous canoe trees, native woodland and grassland are all part of the reserve’s offering. A fenced ‘Back Paddock’ is where we spotted mobs of kangaroos and numerous native birds (Park Victoria 2018). It was a very pleasant experience, and we finished up having coffee and scones at the Historic Homestead. Returning home involved just a few minutes drive which was a lovely change for us! This photography adventure was just part of a day visiting Glenrowan, Victoria – Australia. Hubby and I spotted a number of beautiful scenic spots within this region to stop and take photographs. On the tail end of Autumn, cherry trees at Smith’s Orchard and grapevines at Morrison’s displayed glorious brightly coloured leaves. Local farming landscape scenes hidden away from mainstream roads revealed countryside enjoyed by local farmers and for those who adventure away from the usual beaten tourism track. During this landscape photography exercise – I used a compact system camera, a Sony A7 Mark II – Full Frame with a Sony A FE24-240mm F3.5-6.3 OSS Lens. For all these photographs I used the camera mounted on a tripod with a remote timer. I also used my Apple iPhone 8 Plus mobile phone for quick spontaneous photographs and gain GPS location readings. NB: My camera remote decided to fail during this photography adventure which caused me some grieve in not being able to successfully use the ‘bracketing’ option on my camera. Lesson…bring a spare camera remote!